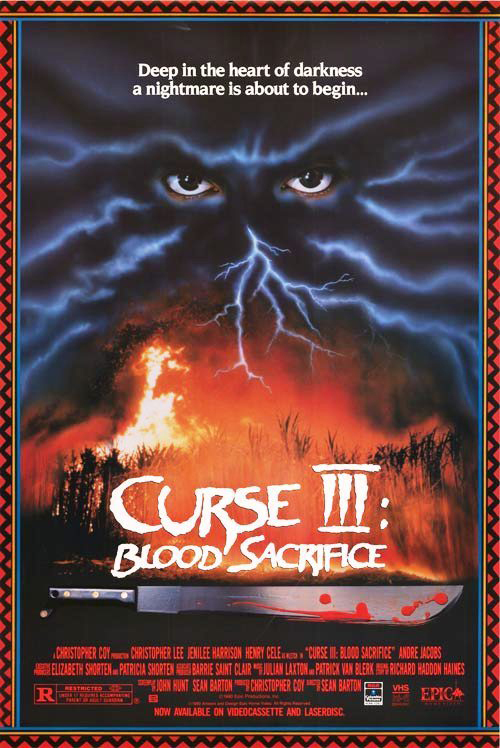 John’s Horror Corner: Curse III: Blood Sacrifice (1991; aka Panga), a B-movie featuring Christopher Lee, an angry Witch Doctor and a lame Sea Demon. MY CALL: In order of release, the Curse movies go from best to worst it seems. Part III has its merits, but they are limited to Christopher Lee and the African setting—sadly none of the effects, horror or death scenes are worth your time. IF YOU LIKE THIS WATCH: Well, The Curse (1987) and Curse II: The Bite (1989), then maaaaybe even Curse IV: The Ultimate Sacrifice (1988; aka, Catacombs). 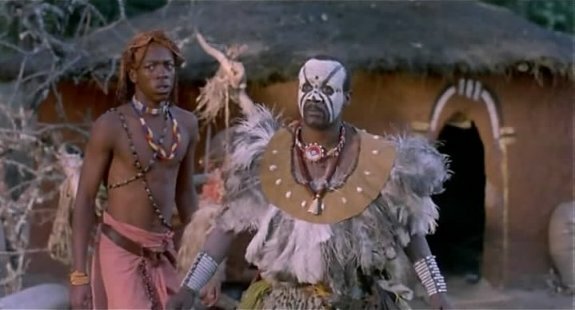 For more horror with ties to Africa, go for The Kiss (1988), The Exorcist (1973; and prequels) and Headhunter (1988). 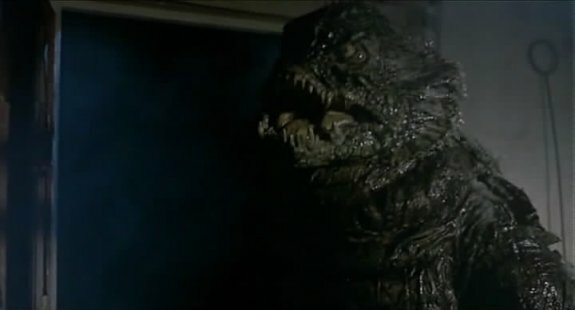 Franchise Continuity SIDEBAR: An adaptation of H. P. Lovecraft’s “The Colour out of Space”, the first “curse” (The Curse) involved melty-fleshed zombies created from an other-worldly ooze that infected the water supply from meteorite contamination (in Tennessee). Clearly having nothing to do with the first film, Curse II: The Bite (1989) followed a man infected by a radioactive snake bite and mutates into a snake-handed, snake-regurgitating monster in Arizona. This third film predates the other two stories, taking place across the world in Africa in the 1950s. In an opening that sluggishly drags us through a typical morning with Elizabeth (Jenilee Harrison; Fists of Iron, Illicit Behavior) and Geoff Armstrong (Andre Jacobs; Black Sails, Demon Keeper), we learn that they are sugarcane farmers in East Africa. The set up for this movie is ridiculous. After Elizabeth mistakenly interrupts a ceremonial sacrifice, the village witch doctor furiously curses them, and he cackles dramatically. Apparently, he summoned a sea demon to exact his revenge. Serving as our expert on all things African occult, Dr. Pearson (Christopher Lee; Sleepy Hollow, The Wicker Man, Howling II) provides much of our exposition. There are some nice shots of landscapes. For an 80s horror film the cinematography is quite impressive. Quite to the contrary, the death scenes were awful, with all kills occurring off-screen—all of them! Isn’t that some kind of horror filmmaking blasphemy? We also don’t see the creature until the last 10 minutes. It looks like a bulky Creature from the Black Lagoon (1954) with more of a tail; basically, a gill man. We see it just long enough for it to roar a half dozen times. It’s basically a rigid rubber monster suit with poor articulation in the mouth/jaw. The only link I can discern between the first two Curse movies is the inclusion of some God-fearing folks who liken the malady as a test from God (or punishment or something like that). But this third film involves a direct curse from a witch doctor. So, as a franchise anyway, these movies share no synthesis. 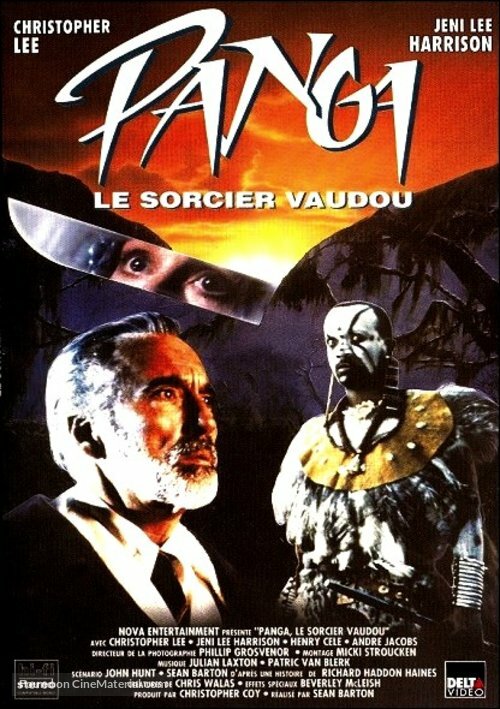 Were it not for the African setting and Christopher Lee, this would readily be even more boring than Curse II (1989). This was all sorts of not good and, for both horror and effects. I’d rank it the worst of the Curse series so far. At least Curse II (1989) tried to show off its lousy effects as much as it could (and makes for a fun nonsense B-movie night), and The Curse (1987) was a B-movie delight! I’d go watch them instead.